Why Longer Mowing Heights Matter – The Natural Way, Inc. There is a direct relationship between the height of the grass and the depth of the roots. The deeper the roots, the more available water in the soil profile and the cooler the roots will stay. If the grass is mowed short, there will more radiant light hitting the soil, drying it out much quicker and raising the soil temperature. Both will kill turfgrass roots. The less light that hits the dirt surface, the less chance of weeds germinating within the turfgrass. The small roots which absorb water and nutrients are very thin and fragile, and they only live a short time before they get sloughed off. Deeper thicker turf roots will generate more organic matter in the soil for better moisture holding capacity, mitigate higher soil temperatures, increase microorganism activity, and increase oxygen diffusion rates in the soil (roots take in O2 and give off C02). Longer grass will require less frequent watering and be more drought and heat tolerant. If a lawn is mowed to two inches in height and a rabbit eats it down to one inch, the grass will die. 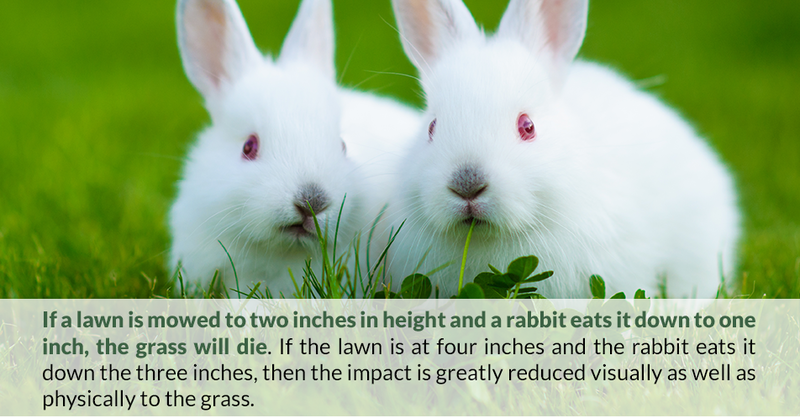 If the lawn is at four inches and the rabbit eats it down the three inches, then the impact is greatly reduced visually as well as physically to the grass. Japanese beetles prefer to lay their eggs in shorter lush grass. Less frequent watering of longer grass will reduce Japanese beetle infestations. Lawns that are mowed taller are less stressed, healthier, and will have fewer fungus problems. Mowing the grass longer will have less of a negative impact on the lawn because a lower percentage of the leaf blade is cut during each mowing cycle. 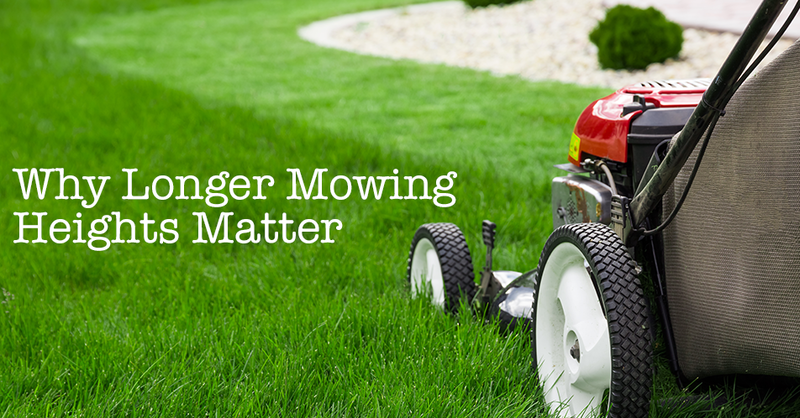 Lawns should not be mowed shorter than 2.5 to three inches in height. During the hot summer months, lawns should be mowed to a height of 3.5 to four inches in height. When temperatures are in the high 90s and above, lawns will use significantly less water if left taller than a short-mowed lawn. Do not remove more than a third of the grass blade height at any one mowing. Use a sharp blade to mow the lawn. The ends of the grass should not be frayed or ripped after mowing. Does your lawn need professional maintenance? At The Way, we’re here to help! Contact us today to learn about our services and how we can help you create and maintain a lush, green lawn.